Naturally decaffeinated green tea, natural flavors. With a chorus of sweet floral notes, Tazo Decaf Lotus Blossom Green Tea is certain to leave your guests feeling fresh and renewed. This mild blend features naturally decaffeinated green tea flavored with the essence of lotus flower for a hint of sweetness. 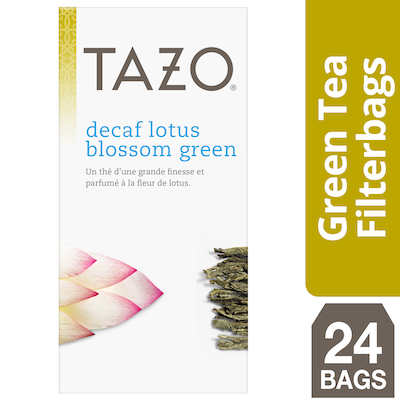 Ideal for restaurants, cafes, hotels, and office environments, this package includes six boxes of 24 individually wrapped bags of Tazo Decaf Lotus Blossom Green Tea. Whether you're an office manager looking to ignite the creativity of your workforce, or a café owner in search of a deliciously unique flavor offering, you will love serving this blend that inspire joys and wonder in every sip.